Greetings and salutations, everyone; yes, once again it is I, Mani the purebred border collie, filling in for the guy I live with, and here to bring you the latest news from our garden. You may remember me from such posts as “Our Winter, Thus Far”, among so many, many others. Here I am in a characteristic pose. This was taken last Tuesday. It’s still characteristic. I’m guarding my Personal Hill, which is just behind me. It was pretty chilly that day. 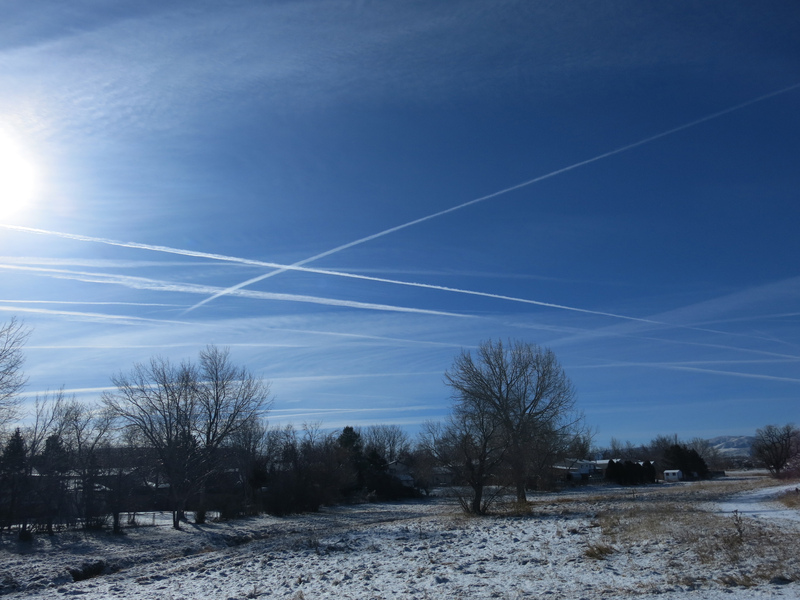 On my morning walk, the jet contrails looked like they were frozen. Maybe they were. This picture is looking south. Looking east. Then it warmed up again, the way it does. 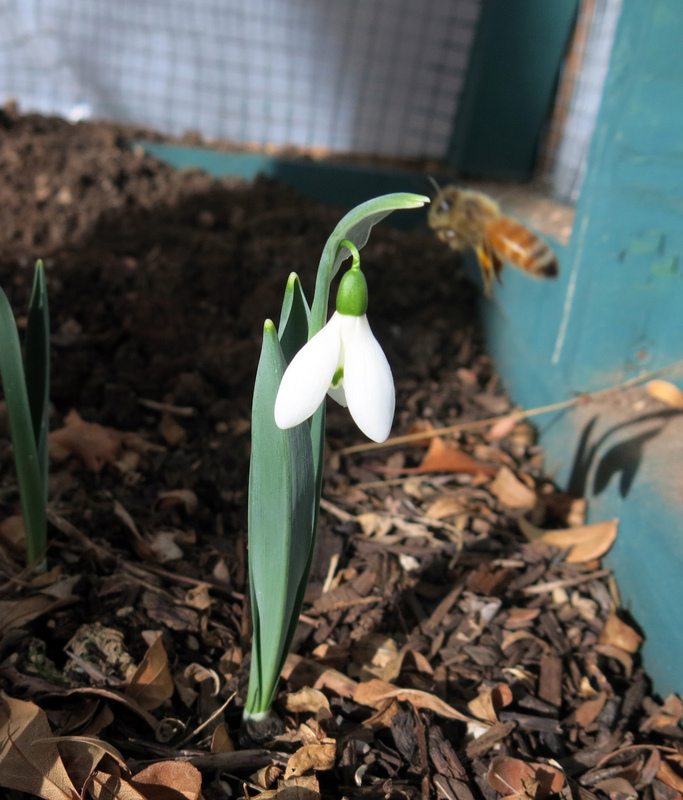 The guy I live with said that there were honeybees clamoring to get into the Snowdrop Frame, so he opened it to let them in. 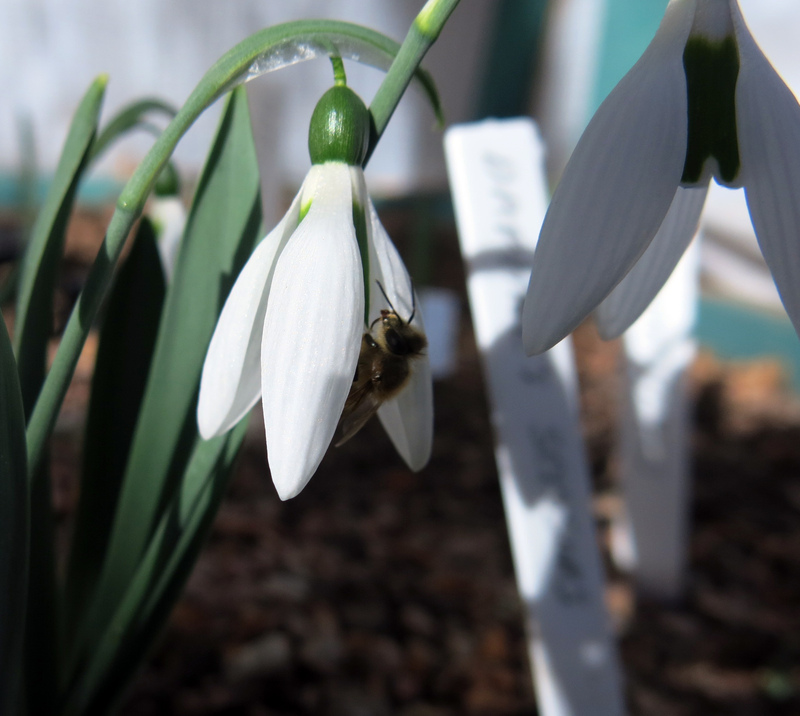 The bees seemed to be pretty happy visiting the snowdrops. 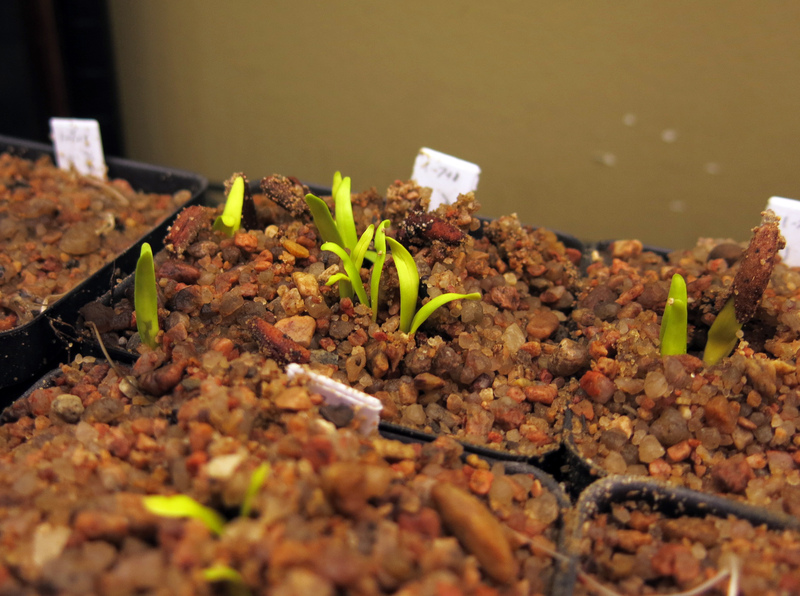 The guy I live with was also happy because the amsonia seed he sowed on the seventh germinated very quickly. Usually nothing happens with amsonia seed but, as you can see, serious things are happening here. These are Amsonia eastwoodiana and A. tomentosa (which some botanists say are the same species). Dryland plants from western Colorado and Utah. That’s really the gardening news, here. He thought these seeds would need stratification or have to be sown outdoors in pots and then nothing would happen, but instead this is happening, the seeds just sown in pots, the pots put in a propagator under lights, and with a heating pad underneath. He also sowed the paintbrush seed. We were going to show how it was done but there wasn’t anything to it and it had to be done in a hurry because we were expecting more snow. The seeds were rubbed, which I guess you don’t have to do, and then sprinkled in the troughs next to the native grasses which have appeared in the troughs (not totally by accident). Then the snow would push the seed farther down into the soil-less mix in the troughs, hopefully. So this happened yesterday. There’s a funny thing about winter here. Everyone gets worried when it doesn’t snow. They even say to water the garden in the winter. 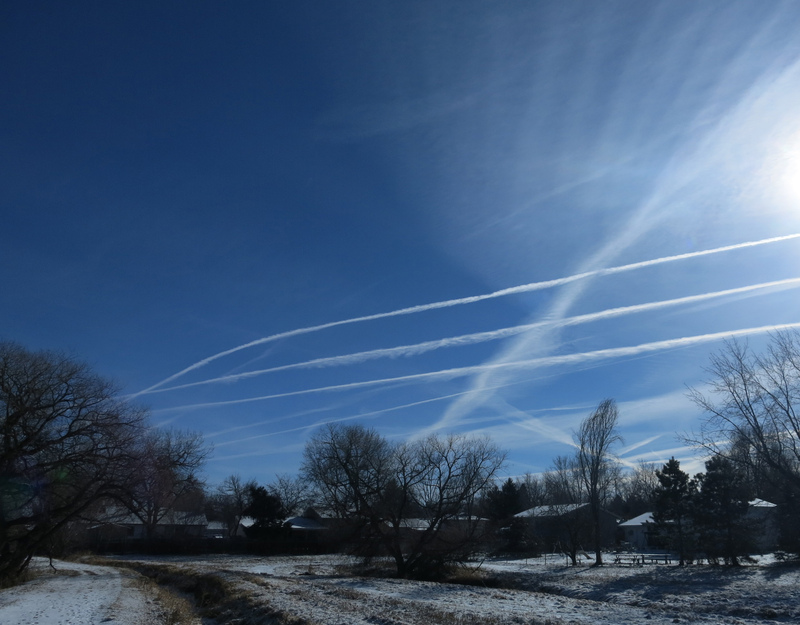 This winter, people were totally panicked. 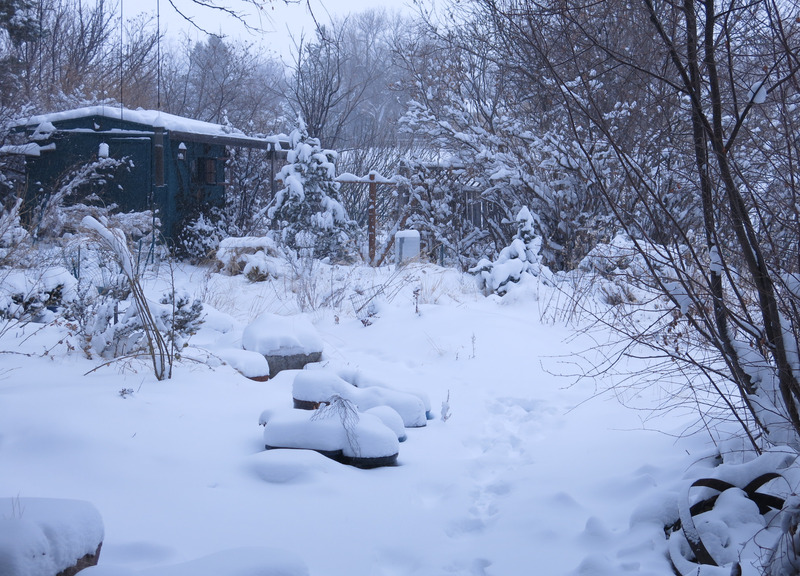 The guy I live with, who’s a worrier, as I mentioned a couple of posts ago, never worries about whether or not it will snow in the winter, and never, ever waters the garden in winter. And nothing bad has ever happened. He’s even had people over to look at the garden after a winter of no watering and they still think the garden should have been watered. The guy I live with said that people can freak out and water if they want to, but it’s not going to be done here. He explained that we’re surrounded by a flora, extending hundreds of miles in every direction, which has never been rained on in the winter, no one ever waters it, and yet the plants still live, because they’re adapted to dry winters. The snow that falls on the garden in winter is just snow. Like the Zen saying, “Mountains are just mountains”. It evaporates under our hot winter sun, which is good, because a lot of the bulbs in the garden would rot in the winter if they got wet. The snowdrops are a different story, because they’re growing now; not dormant. Anyway, it wasn’t very cold but there wasn’t much of anything to do in the garden so I spent time on the soft Pottery Barn sheets, like any normal person would. I wasn’t sleeping, as you can see, just being as soft as the sheets. Today the sun came out. The guy I live with has been watching Sherlock Holmes on TV and he said he would get out “the long lead” yesterday (like in the Bruce-Partington Plans, at the end, in the TV version), so I could enjoy walking in the snow more than usual, and it was even better today, though it was also windy. That’s really all that’s been going on here. Oh, the guy I live with got some pistachios which were supposed to be roasted and salted but they were unsalted. He said that he couldn’t re-salt them once they were unsalted. I didn’t understand that. It was a really big deal, though. They were icky, so he got some roasted and salted pistachios to make up for it, later. He said that Chess loved pistachios, but I haven’t tried them yet. 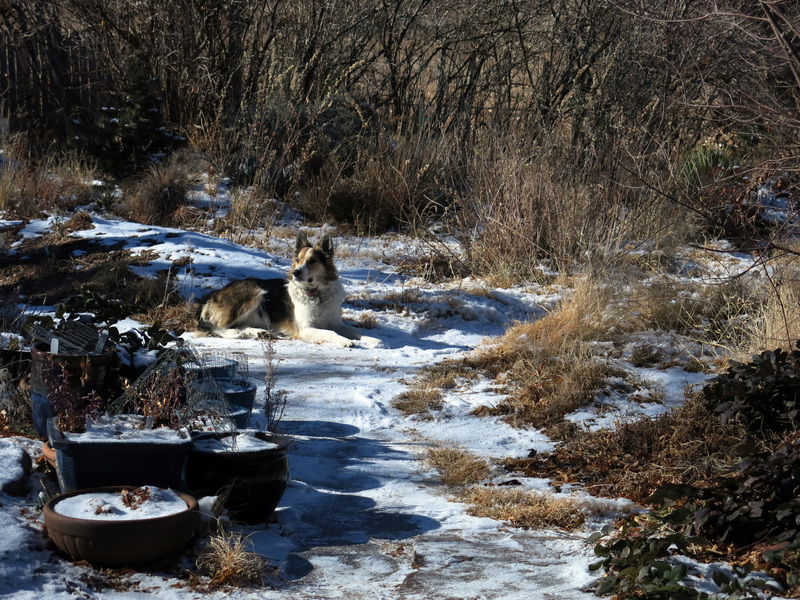 And he said the snow might be gone by June, so I guess I’ll be spending quite a bit of time walking on the long lead, sleeping on the bed, and on the couch. The guy I live with has been sitting with me on the couch in the evenings, and I like that a lot. We listen to records. I guess they’re called CDs now, but about his favorite thing to do most of his life was to sit and listen to records, so he still calls them that. Gardening always came in second. Well, I know this has been another of my rambling posts. 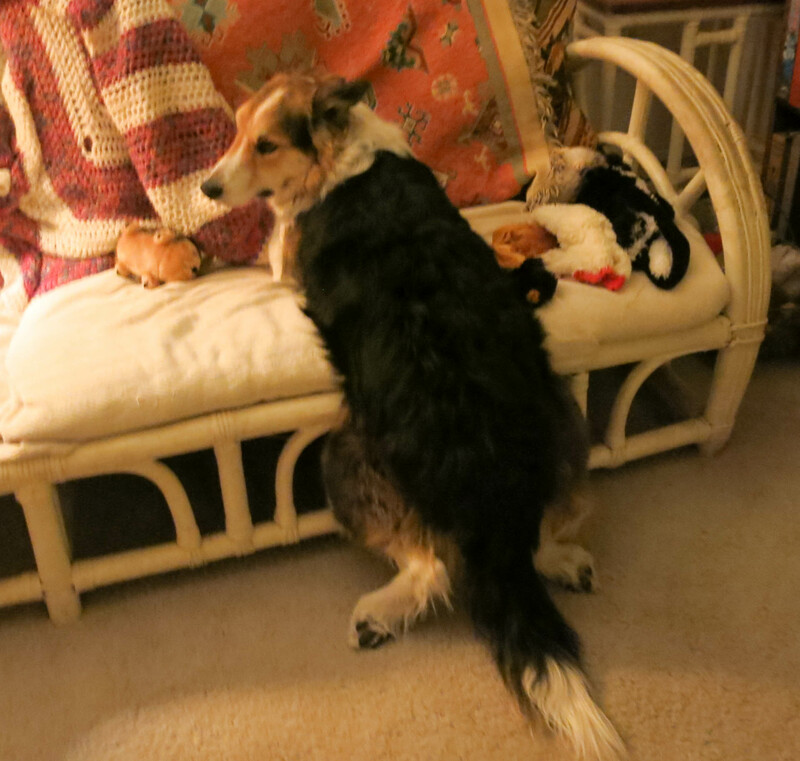 I’ll leave you with another picture of me almost on the couch. How are your friends the Effelant and Lamb Chop? They’re fine; warm and toasty in my Upstairs Fort. Splendid. It is good to know they are warm inside when the weather is so cold outside. They are. It’s only a few degrees below freezing right now, outside, though. Yes, only. Twenty-nine degrees is not very cold. For here. Well, it is good that your friends are warm inside anyway. Not very cold outside, but they would be lying in the snow, which is sad. Thanks for the videos of your walks Mani. I like to pretend I am on the holding end of your leash. I don’t have a dog to walk right now, and I enjoy watching what you sniff and explore. It’s pretty fun. All sorts of little mammals make their home in the field, and sometimes they make tunnels I can look into. You look very regal in that first “characteristic” pose. I like that shot very much. Unexpected seedlings are very exciting news! I hope they thrive. Thanks; my Personal Hill is very important to me, and so I need to look regal next to it. The guy I live with was feeling kind of down about the garden, lately, and so seeing the seedlings was a big boost. I’m kind of super-ticklish where my hind feet are concerned, if you didn’t know. Well, my front feet, too. I do like cuddles, though. Technically the toys are supposed to be in the Toy Basket but they aren’t always. I have a lot of toys. So did Chess, if you remember. I like having different ones to choose from depending on my mood. I do sometimes get wrapped around things and the guy I live with has to walk around an unwrap me. If there’s something scary he can reel in the leash, though he just grabs it and pulls. We don’t see too many scary things on my walks and I guess we’ll be going back to the regular leash “if the snow ever melts”. It was nice enough today that I could lie out on the back patio for a while. That’s one thing about living here; there might be snow on the ground but the air is quite warm. Hmm. I have been Very Sick with a Hellish Head Cold, so perhaps I lost track, but I became concerned because — no posts from Mani. Just on the off-chance a posting may have got by me I came here to check. AND! a video of you on the long leash! Splendid stuff. 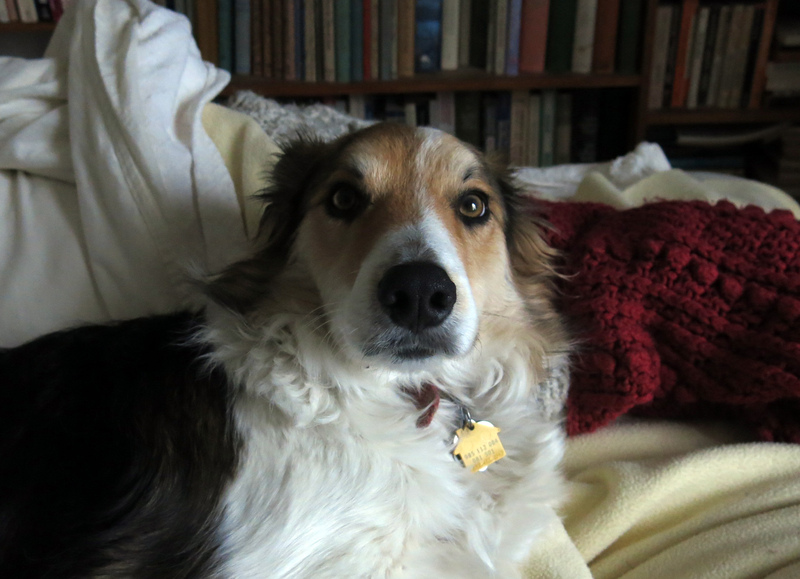 Oh, was that the wind blowing or border collie snuffles? Love the shot of the snowbound manor house looking quite cozy; you look equally cozy on soft sheets or in the sunny garden guarding your Personal Hill. Your coat goes well with coral shades. Does the guy you live with know about the Shree Rama Lama Ding Dong, that’s he, David Johannsen, three-hour Sunday morning show on Sirius? Easy to listen and eat properly salted pistachios. An eclectic playing of records to beat all. If I were a honeybee I’d want to reach those snowdrops too. Thanks. That was the wind blowing my leash around. There’s been snow on the ground for a week now (imagine the moaning and groaning), though not really cold, so there hasn’t been much to post about lately. Sorry about the cold. The guy I live with explained just how bad they can be. He doesn’t get sick very often, but remembers the really bad ones.